Kanchikudichchi Aru, which was captured by the Police commandos on Monday. Defence Secretary Gotabhaya Rajapakse told The Island yesterday that the Government had commenced a probe into the NGO’s contribution to the strengthening of the LTTE in the East. Some of the vehicles abandoned by the fleeing LTTE cadres, too, had been given by foreign NGOs, he said. The NGOs had helped rebuild the LTTE under the pretext of tsunami reconstruction and rehabilitation projects, Mr. Rajapakse said adding that that situation called for a special investigation. He said, according to information that the military was now receiving, some foreign organisation had kept on replenishing medical supplies to the LTTE. 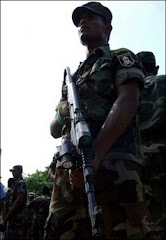 Following the fall of the Stanley Base, a large number of civilians, used by the LTTE as their human shields, had started to pour into the cleared areas from the areas currently under the LTTE control, he said.